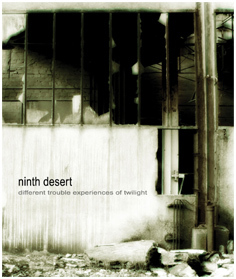 Recorded between 2005 and 2006, "Different Trouble Experiences of Twilight" sums up all of the best characteristics of Ninth Desert's sound. Most of what I've written regarding the "Collision H" EP could be repeated about his first full-length, but this is also, predictably, more varied (with its 5 tracks clocking in at 54 minutes). And possibly darker, with more than a few blood chilling moments, though staying away from most dark ambient projects. The most diverse piece is surely "Somewhere Close to the Skin", with its mind-altering metal rattles, pounding percussion and pink-noise billowing. The rest of the disc offers more of Herry's fine layering of drones and circular frequencies, and the album title is perfect to describe its atmosphere. Take the sinister hum and slow metallic rumbling of the final track, "Red Mute": I wouldn't compare it with anything Lustmord- or CMI-related, but it is no light-hearted wallpaper ambience either. Think of Lull or BJ Nilsen's dark-edged minimalism and maybe you'll get the picture. Awesome stuff.